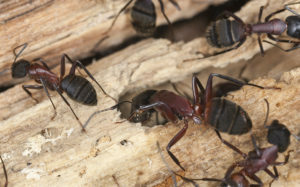 Carpenter ants are prolific and destructive. When left untreated, they continue to populate, and cause significant structural damage. Croach® licensed technicians have access to specialty products and tools that are not available in the retail market. It is important to understand the three levels of infestation before turning to DIY pest control methods or the internet. Each level requires different methods of ant control. 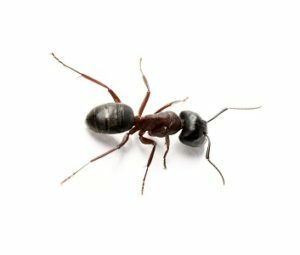 You see carpenter ants on your home, but have no proof of infestation. They’re just checking out the neighborhood. However, you still want to send them packing. At this point, you can generally keep them away with basic pest control methods designed to eliminate and repel. The next step up reveals foraging workers and slight damage to property. At this point, there might be one or more nests forming in your house, or there is one nearby. This level of infestation will call for a professional application of a more aggressive product, along with baiting to eliminate the colony. At this level, the ants are in your walls. The previous methods might keep them from coming into your home, but you have to get rid of the colony itself. Your Croach® technician will need to perform a drill and treat service; which requires drilling small holes into the wall voids and inserting product that will eliminate the problem. This application requires a special (WDO) license. After Croach® has eliminated the carpenter ant colony the ants are gone, but you’re not protected from their return. Repair damaged or water-logged wood and other structural damage. Cut back vegetation that touches your home and any wires leading to it. Seal off any breaches where carpenter ants can re-enter. If you have firewood, store it away from your home and off the ground. Every situation is different. 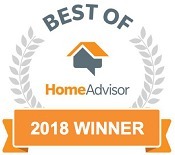 Your Croach® technician is an expert when it comes to special circumstances that you may need to consider, and will advise you on any next steps you need to take. 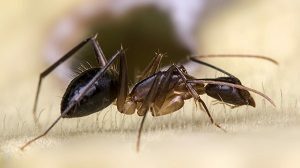 Ongoing pest and carpenter ant control services will protect your property, and effectively manage prevention of pest issues in the future. For more information or to schedule a free inspection, contact Croach® today.